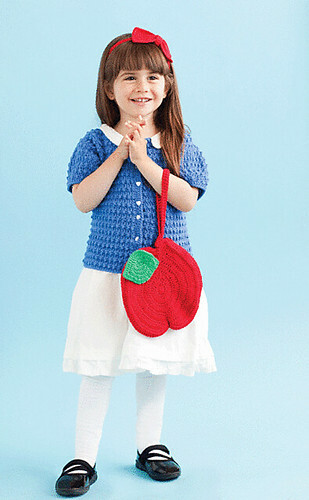 The online previews for Crochet Today’s September/October 2011 issue are up now (and you may even have the magazine, if you’re a subscriber). This issue includes a fun little section of Halloween/Everyday patterns in it, and my contribution is the Fairest One Of All Set (sweater, headband, apple bag). I leaned heavily toward the “everyday” part of the story, because I personally would want the kid who wears this to get a lot of use out of it. Each piece is worked in sport weight wool, which was a pleasure as I just love the way thinner yarn drapes. The cardigan is made with mock bobbles that are easy to do, and the mini peter pan collar and heart buttons make it extra sweet. The bag and headband can really be made for any age (and if you want a larger bag, just use thicker yarn, although I can’t predict how big it will turn out, it will be fun!). This issue is a fun one, with some of my favorite projects being the Amigurimi of NY and the Annie Hall Cardigan. Be sure to look for it on a newsstand near you. Great pattern. The whole section of the magazine is definitely super fun! And I love the section on NY inspiration, too. I'm beginning to see your name everywhere-so awesome!